Comedians Ashley Storrie, Christopher Macarthur-Boyd and Rosco McClelland challenge each other to cook revolting dishes in Ready Steady Puke. 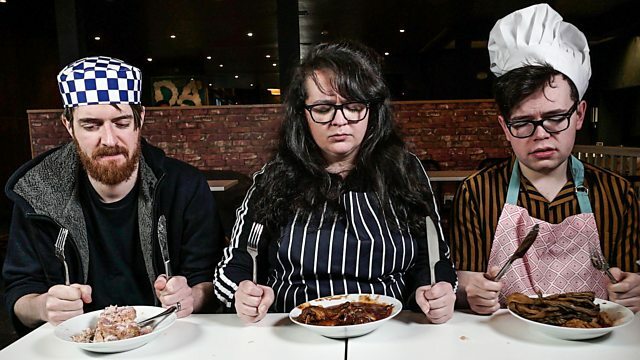 Comedians Ashley Storrie, Christopher Macarthur-Boyd and Rosco McClelland challenge each other to cook the most disgusting dishes in Ready Steady Puke. With the world going to rack and ruin, the trio prepare for the final apocalypse by testing their survival skills in an Escape Room – can they solve the clues and escape within the hour? In this social media world of self-help and tips for life, they hone their combined experiences in “A Guide to Going Out” revealing the pitfalls and tricks to ensure a successful night out! Rosco cooks up a “Hot Lard” dish for Ashley and Christopher – but who will boak first?